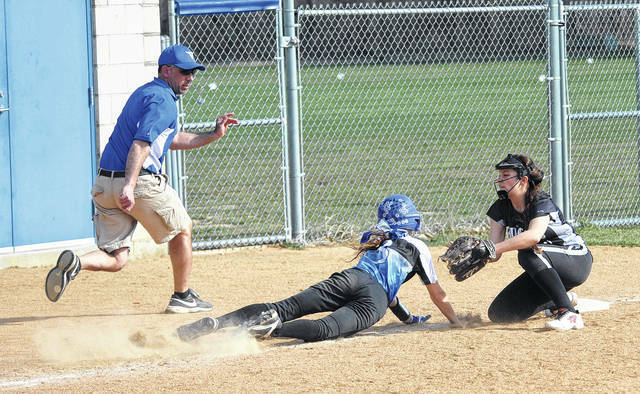 Mike Ullery|AIM Media file Miami East’s Sam Urban, seen her sliding back into third base during a game last season, signed to play softball for Bluffton University Thursday. David Fong|Troy Daily News file Miami East’s Blaine Brokschmidt, seen here competing at last year’s state meet, signed for track and field to Youngstown State University Thursday. 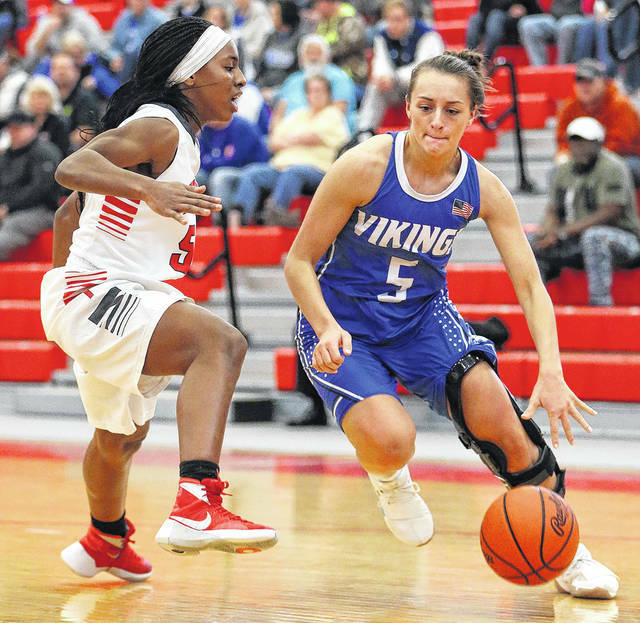 Lee Woolery|Troy Daily News file Miami East’s Morgan Haney, seen here in a game against Troy last year, signed for women’s basketball to the University of Albany Thursday. Mike Ullery|AIM Media file Miami East’s Conner Wilson, seen here hitting a cross against Greeneview this fall, signed for men’s soccer to West Virginia University Thursday. CASSTOWN — After missing her entire sophomore season with an injury, Morgan Haney wasn’t sure what her options would look like when it came time to choose a college. As it turned out, all the work the Miami East point guard put in paid off. Haney, about to enter her senior season with the Viking girls basketball team, officially signed her commitment to attend the University of Albany and play at the next level in Division I women’s basketball — one of four Viking athletes to sign college commitments Wednesday night at Miami East High School. For Haney, the last choice turned out to be the correct one. And when asked what it took for an athlete from a small-town D-III Ohio high school to sign to attend a D-I college in New York, Haney’s answer was simple. “Time and time and time in the gym,” she said. “I’ve been playing basketball since I was five years old. Just staying after practice — I work out with my trainer and do stuff in the weight room every single night. The road wasn’t as easy as it sounds for Haney, though. After a stellar freshman season, she missed her sophomore year with a knee injury, leaving questions as to how she’d recover. 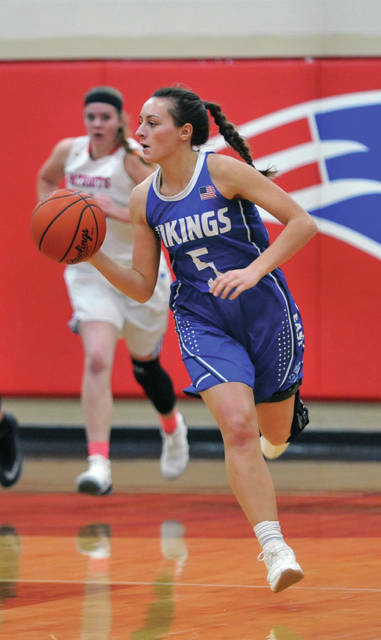 She answered those during her junior season by being named the Cross County Conference Player of the Year, scoring 18.8 points per game and leading the Vikings to their first league title in four seasons. She also earned All-Ohio special mention last year. Two other Vikings also signed to play for D-I colleges, with Conner Wilson signing to play men’s soccer for West Virginia University. 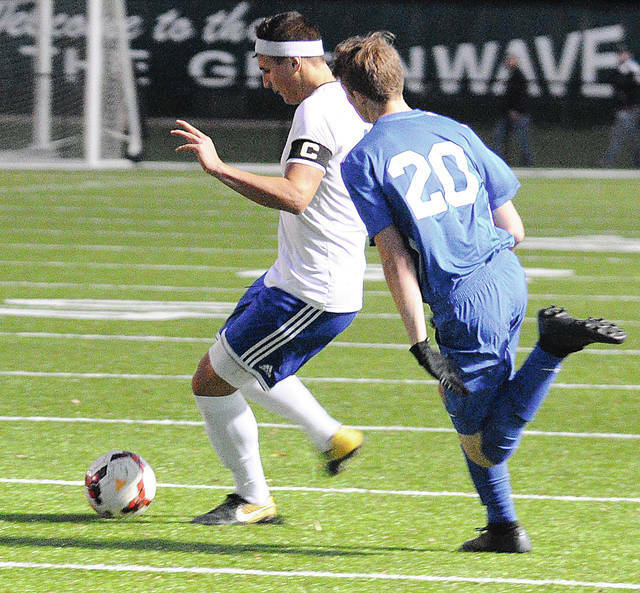 Wilson set a single-season scoring record for the Viking boys soccer team during his senior year with 44 goals this past fall, helping lead Miami East to the boys soccer program’s first D-III district final appearance. And now he will move on to play for the Mountaineer men’s soccer team, which, although WVU is a big 12 school, competes in the Mid-American Conference. Blaine Brokschmidt also signed to attend Youngstown State University and be a part of a D-I college track and field team. Brokschmidt is a two-time state qualifier for the Vikings, placing eighth in the pole vault as a sophomore and then fourth during his junior year. He also holds Miami East’s school record in the event, clearing 15-0. And Sam Urban, a senior for the Miami East softball team, signed to attend Bluffton University and play D-III college softball for the Beavers. https://www.dailycall.com/wp-content/uploads/sites/30/2018/11/web1_041318mju_sb_cov_112018413192615122.jpgMike Ullery|AIM Media file Miami East’s Sam Urban, seen her sliding back into third base during a game last season, signed to play softball for Bluffton University Thursday. 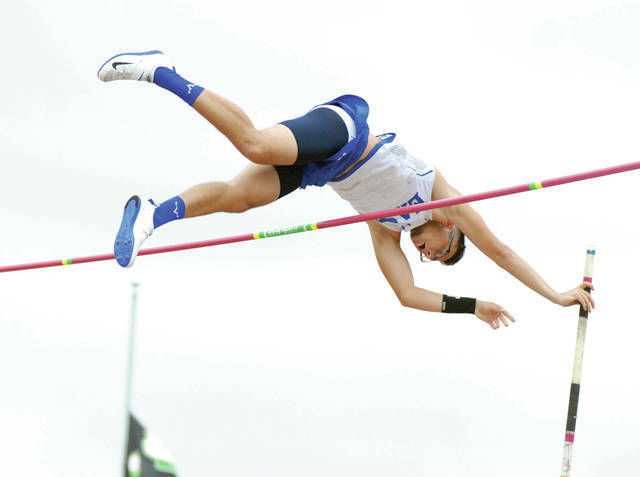 https://www.dailycall.com/wp-content/uploads/sites/30/2018/11/web1_060118df_me_brokschmidt.jpgDavid Fong|Troy Daily News file Miami East’s Blaine Brokschmidt, seen here competing at last year’s state meet, signed for track and field to Youngstown State University Thursday. https://www.dailycall.com/wp-content/uploads/sites/30/2018/11/web1_122317lw_me_haney.jpgLee Woolery|Troy Daily News file Miami East’s Morgan Haney, seen here in a game against Troy last year, signed for women’s basketball to the University of Albany Thursday. https://www.dailycall.com/wp-content/uploads/sites/30/2018/11/web1_conner2.jpgMike Ullery|AIM Media file Miami East’s Conner Wilson, seen here hitting a cross against Greeneview this fall, signed for men’s soccer to West Virginia University Thursday.